Acting President Yemi Osinbajo has sacked Lawal Daura, director-general of the Department of State Services (DSS). Laolu Akande, spokesman of the acting president, disclosed this in a statement on Tuesday afternoon. No reason was given for the action but Daura was directed to hand over to the most senior officer in the organisation. 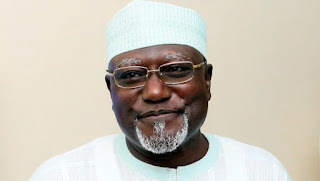 “The Acting President, Professor Yemi Osinbajo, SAN, has directed the termination of the appointment of the Director-General, State Security Service, Lawal Musa Daura with immediate effect,” the statement read. It is unclear if Osinbajo’s action is connected with the siege laid to the national assembly. Federal lawmakers were denied access to the upper and lower legislative chambers on Tuesday morning. Under Daura, the DSS was accused of arbitrary arrest, intimidation and disregard for the rule of law. The former DSS DG was appointed on July 2, 2015, following the resignation of Ita Ekpeyong. Daura joined the DSS in 1982 and rose to the rank of director. Between 2003 and 2007, he was the deputy director of presidential communication, command and control centre at the presidential villa, Abuja. He has also served as the state director of the service in Kano, Sokoto, Edo, Lagos, Osun and Imo states. He attended various professional courses within and outside the country including, the National Institute for Policy and Strategic Studies, (NIPSS) Kuru. He hails from Katsina state.